Hi all, just wondering if anyone has run into this problem before. On my st184, the ceiling light doesn't come on when the doors open, despite the door lights and boot light coming on (so it's not the switch on the doors that's the problem). It comes on if turned to the "on" position, but that's it. I took the assembly apart and cleaned the contacts, but no love. If you remove the plastic cover to change the bulb you will see the switch uses a little metal ball to make contact on parts of the circuit. Everything becomes rusted and stops conducting electricity. Thanks. I'll give it another try and report back. I got it working! That makes me so much happier than it really should. I was going to post a writeup with pics incase anyone having the same problem stumbles on here, but I seem to have used all but 16kb of my photo allowance on here (unless I'm doing something wrong). Anyway, I pulled the translucent cover off and used a scrap of speaker wire to short the circuit between the bulb and the "door" contact. The bulb lit, so that told me the problem was somewhere between those two points. I grabbed a sharp flathead screwdriver and scraped the two contacts down to shiny metal, and viola! So if anyone else is having problems with their ceiling light not coming on in the "door" position, but other door activated lights coming on fine, try cleaning the contacts in the switch. Post photos on image sharing sites like imgur, and then link the photos back here. 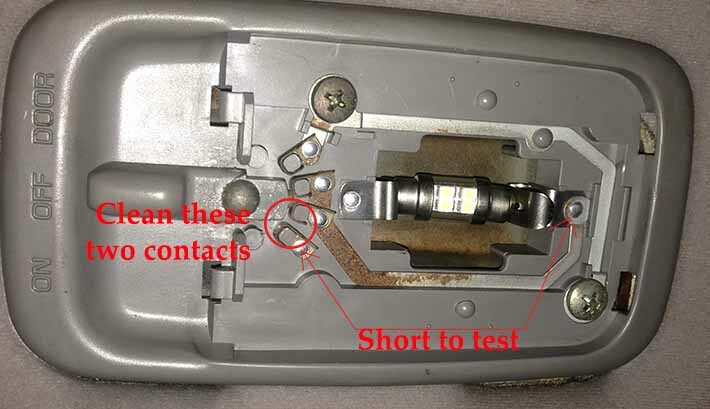 Okay, Here's a photo showing where to short the circuit to test the bulb comes on, and where to clean the contacts. Try not to drop copper wire filaments on your face like I did. Edited by Morelia, 24 February 2015 - 09:10 PM. Ha! I figured it out. I win the internet.